What started off as a shopping day with my best friend Gabs quickly turned into me obsessing over her outfit. It was my day off from Nordstrom, where I work as a salesperson, when I called up Gabs and asked if she wanted to go to some of our favorite stores in Georgetown. The answer was obviously yes. As you can see, Gabs’ style is distinctive and fun. She’s sure to carefully choose each piece she wears, from her necklace to her sandals, achieving an aesthetic that makes you look twice. “Arm candy” is what Gabby calls her jewelry, adding that ‘”no look is ever complete without some.” Today she was feeling the chunky look, as you can see from her thick metal necklace to her black and gold ring. As you can see, she also loves to mix metals. “Never feel afraid to mix gold and silver jewelry. I do it all the time and it blends together, creating an artsy look,” Gabs said. The gladiator sandal is an easy go-to shoe for spring and summer, and Gabs chose a chunky heeled pair for a hint of height and a fun take on the trend. The silver buckles on these straps spice up the sandals, giving them an edgier look. “Since this was once my grandma’s bag and because I adore anything vintage, this bag is perfect for me,” Gabs explained. As always, you can’t go wrong with a classic black bag. The twisted chain on this one adds flair, while its size makes it perfect for toting your choice essentials for a night out. 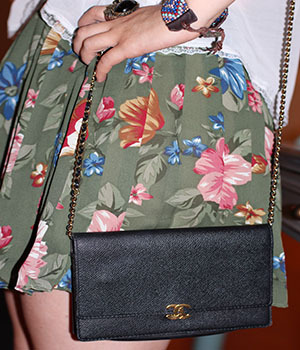 With its lengthy chain, this bag can even be worn cross-body if you want to switch up your look. What do you think of Gabs’ look? Do you love Gabs’ vintage bag as much as we do? What kind of jewelry are you wearing this summer? Let us know with a comment!